These three products can help defend your skin from some of the effects of aging. There are tons of skin care products for anti-aging on the market. Finding the ones that promise results and the ones that deliver those results can be a challenge. However, I recently tested the Dermagist Complete Rejuvenation System that I think you will be interested to learn more about after what this three-product group did for my complexion. I started with the Original Wrinkle Smoothing Cream for the first few days. This delivered superb moisture while penetrating deeply to the DNA level to repair skin damage and boost your own natural collagen and cell regeneration with Matrixyl, Renovage, and Sodium Hyaluronate. What I noticed upon applying this cream twice a day was that a few small lines looked more filled in than before use. I also liked the fact that it did not look greasy either with a comfortable lightweight consistency. After the first three days of preparing my skin, I tried the Instant Effect Lifting Serum, the second stage in this system. Once you apply this lightweight serum, you will feel a slight tightening effect from the ingredient, Sesaflash at first. But when you glance in the mirror, you will be amazed at how quickly this product seems to rejuvenate your face with Matrixyl as well to keep those problems away as long as possible. You will see a beautiful difference that will astonish you. 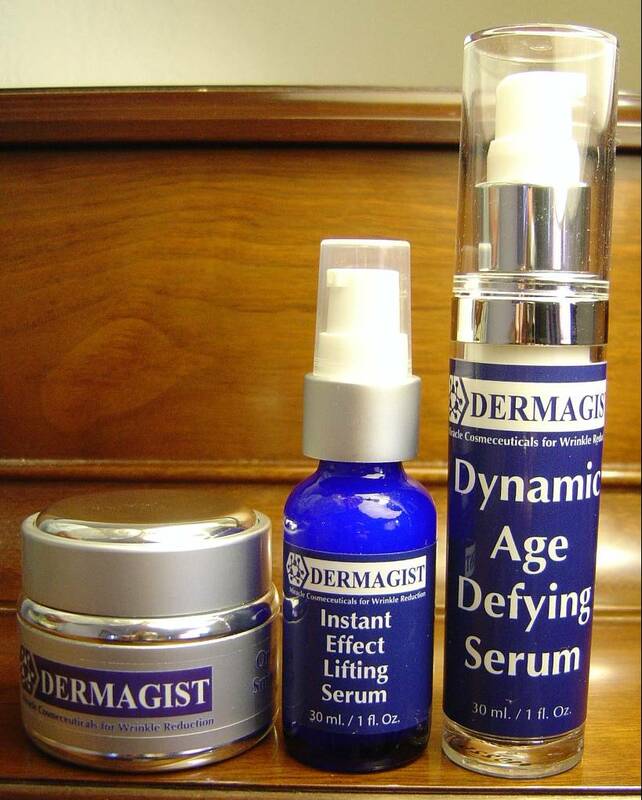 Lastly, I experimented with the third stage of the Dermagist Complete Rejuvenation System, the Dynamic Age-Defying Serum. I only was ten days into this program and thought my face was the best it was going to look and hardly needing much else. And then, I put some of that serum on twice daily and understood what exactly it did. I sighed with happiness over the next days as I watched some small marks vanish from my complexion. I had never expected to see them leave since other products to banish them failed. My skin now does look more luminescent than before this system and somewhat younger. The texture is also softer and the pores are more refined. I seriously don’t know how long these anti-aging effects will last. But, I am quite impressed with how immediate the results were in the first place. Honestly, I love this Dermagist Complete Rejuvenation System and would love to try more of their products to see how they compare. Do yourself a favor and check this company out for yourself. Previous Post Are You Interested in Making Your Sweaters Look New Again? I'd love to try eye revolution gel.